Mark your calendars! E-Day will take place on February 23, 2019 from 9 am – 1 pm. 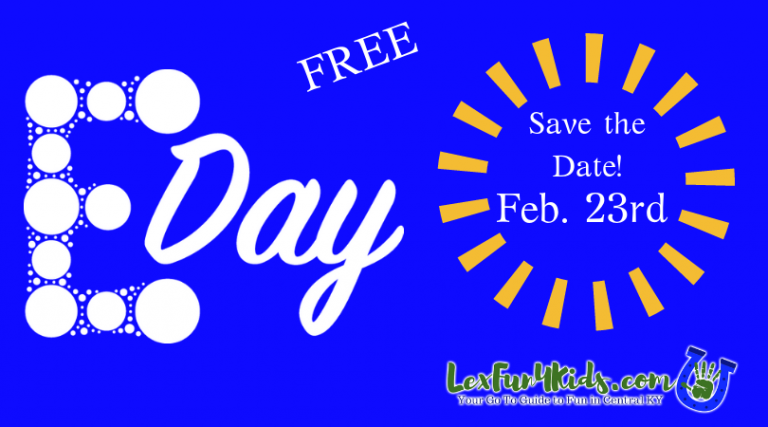 The 2019 E-Day celebration at the University of Kentucky in Lexington is on Saturday, Feb. 23, 2019 from 9 a.m. to 1 p.m. EST and 9 a.m. to 3 p.m. CST in Paducah. E-Day comes at the end of Engineers Week, an annual event sponsored by a coalition of more than 100 professional societies, major corporations and government agencies dedicated to promoting math and science literacy and ensuring a diverse and well-educated future engineering workforce. E-Day is a “come and go” type event. Most activities do not a have start time, although a few contests (Egg Drop come to mind) will have a definitive time for judging. Most people find that they can’t make it around to every exhibit and contest because we have so many, so it is advisable to get here close to 9 am. We also have a mobile app to help you plan your day ahead of time and navigate our maze of exhibits. It is available as a FREE DOWNLOAD in the App Store for iOS. Click here for the iOS version.